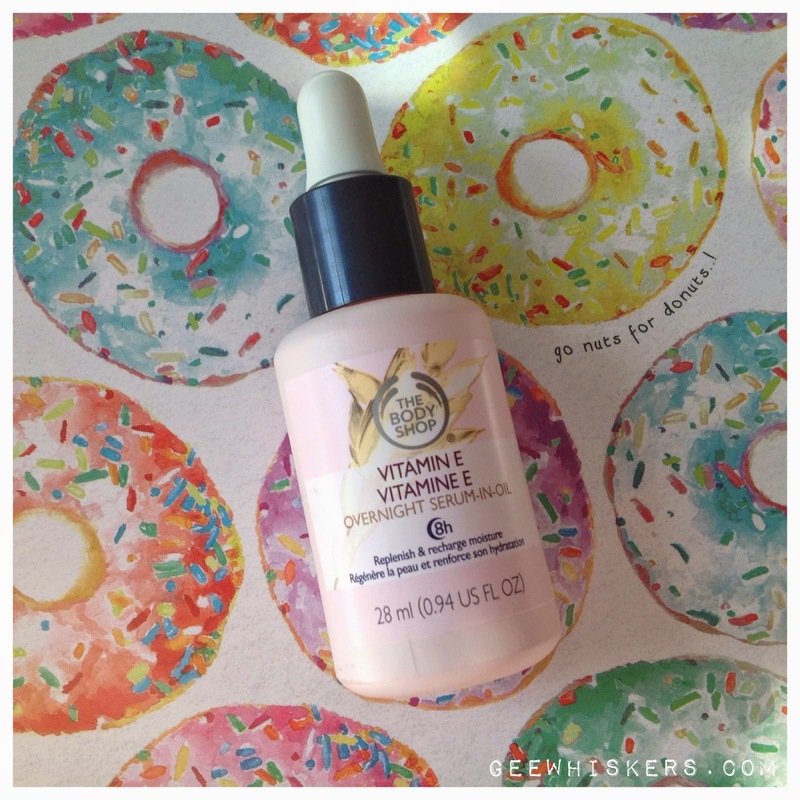 The Body Shop Vitamin E Overnight Serum in Oil / Gee Whiskers! I have recently been loving The Body Shop's Vitamin E range and was finally able to get my hands on their Vitamin E Overnight Serum in Oil. It was really a struggle for me to find one so I was thrilled when I spotted one in Canal Walk. The serum comes in a pretty pink glass bottle. As the name suggests, the serum is mixed into oil (wheat germ oil) which really amps up its moisturising capabilities. As mentioned before, I battle with very dehydrated skin and love products that help to rehydrate my skin. The serum is rich but I haven't battled with any breakouts from it. It really helps improve the moisture in my skin and by the third night I could start feeling an overall improvement in my skin's tone. When I really battle badly my skin looks dull and tight. Recently I have been spending more time in front of the fireplace which makes my dehydration even worse. My chin area was VERY dry and basically felt cracked and horrible. I used this serum twice a day and by the forth day my chin was all back to normal and looking good. Although this is oil based, it absorbs quickly and doesn't leave you with an oily film on my skin at all. At R140, I am SO impressed with this product. I am absolutely loving The Body Shop's latest product offerings. I pair this serum with the Vitamin E Aqua Boost Sorbet face moisturiser (read my review here) and my skin has been looking absolutely amazing! I could never imagine being able to get a moisturiser and serum for under R300. The serum is R140 and + moisturiser R135 = R275 well spent! Ooh, glad to hear you like this! I picked it up on Tuesday on a whim because of TBS's 20% off sale - excited to start using it! Thanks Heather! It is worth every cent.